Sam Milby's character in Halik as Ace Corpus continues to irk netizens and has generated furious reactions among televiewers. For Sam, such reactions just prove that he has been playing his role effectively. "I do get a lot of hate mails, hate messages, death threats and it means that I'm being effective as an actor and I am really happy about that but i think the show is really doing well also because so many people can relate and that's kind of a sad thing," he said in an interview with PUSH at the ABS-CBN station ID shoot. Sam hopes that more Filipino men become like Lino, Jericho' Rosales' character in the show, than his unfaithful character Ace. "The truth of the matter is there are a lot of infidelities. It's so common here in the Philippines. There are 'yung mga kabit eh di ba? It's sad in a way but that's why so many people can relate to the show but I really hope and pray, I see this tweet all the time, 'Be a Lino in a world full of Aces,' and that's true. The character and the heart that Lino has, even everything he has been though. We need more people like Lino," Sam said. The actor has a message for men who commit infedility. "We are all humans. We all have our weaknesses especially you know lust is one of the things we easily fall into. I think it's really just if you are a believer of Christ and you have faith, you should always fall back to the vow that you made with your wife through better or worse. I mean, in this world we easily give up pag may problema, but that's not marriage is, marriage is you worked through everything. 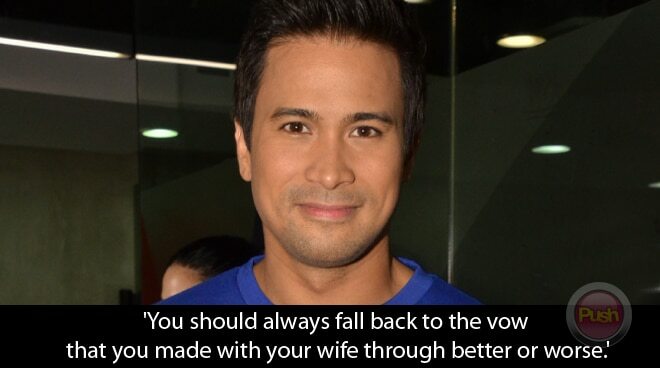 Parang it's a life-long commitment and I believe if you realize that you made a mistake, you humbly come to your wife or spouse and to God and just say I'm sorry and repent. I still believe that things can be saved and people can change and marriage can still work out," Sam stated.